Thanks to a series of papers (Haak 2015, Gunther 2015, Martiniano 2017, Lipson 2017, Valdiosera 2018, Olalde 2018) in addition to the three recent papers by Olalde et al., Marcus et al. and Villalba-Mouco et al., we have a fascinating collection of samples for southwestern Europe which span the series of transitions occurring between Late Paleolithic to Late Neolithic. It might therefore be useful to summarise & collate the data into a broader context. Easy Does it! The Hunter-Gatherer Background. It has become evident that early Palaeolithic populations were sub-structured along lines which broadly coincide with archaeological horizons such as the ”Initial Upper Paleolithic’’, Aurignacian, Gravettian, etc, although details are still not completely understood. Whilst Proto-Aurignacian and Aurignacian finds are known in Iberia, the real consolidation of settlement south of the Pyrenees begins during the Gravettian period, which is associated with the dispersal of new cultural elements, population shifts and lineage dispersals (e.g. Y-hg I) throughout Europe and the adjacent Near East. 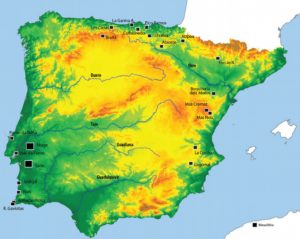 During the LGM, Iberia was one of the few places in Europe where population numbers did not drop or collapse altogether, and might in fact have grown slightly. It is therefore natural to view the Franco-Cantabrian zone as crucial to the repopulation of much of Europe during the climactic amelioration. However, this process was probably more complex than what is generally envisaged. Indeed, we see that Franco-Cantabria had itself been continually acquiring admixture from further afield. One clue in this process might lie with mtDNA U5, which is first attested in the Pavlovian – Gravettian, c. 33/ 30, 000 cal BP. It subsequently appears in Italy (Paglicci-71) and Iberia (El Miron), both c. 18, 000 cal BP (c/w Early Epigravettian & Early Magdalenian), and then becomes prolific following the Bolling-Allerod transition, alongside the dispersal of Y-hg I2a-L460 and R1b-L754. These impacts are most ostensible in northern Iberia, which suggests that people were arriving either via central Europe or northern Italy. Further social and economic changes occur during the Mesolithic, with increasing shift from game-hunting to lifestyles focussed on aquatic resources and the development of shell middens. Overall, these developments were gradual and cumulative, especially in the west and south, manifest by lasting Goyet/ Aurignacian-like ancestry and the persistence of Y-haplogroup C1a in late Mesolithic Iberian hunter-gatherers. qpADM – Generated Admixture graph for Northeast and Southeast Mesolithic individuals (full output below). The Neolithic transition & beyond; forager-farmer interactions. The Cardial Neolithic expanded across the Western Mediterranean by 57/5500 cal BC, introducing the Neolithic package, Cardial pottery, etc. Although Sardinia had been visited during the Mesolithic, concerted settlement begins with the Neolithic. 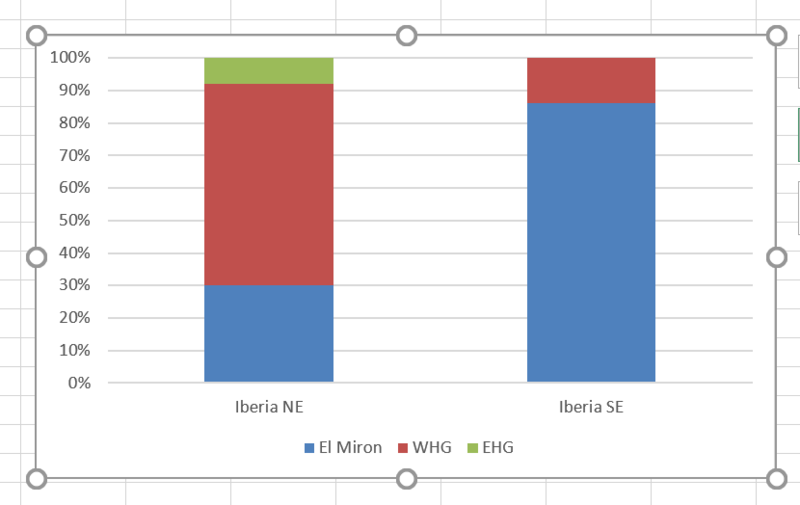 In Iberia, most Cardial sites are coastal, but further inland sites have also been sampled. All analysed individuals are genomically similar to other Early European Farmers, who ultimate descend from Anatolia & the Aegean. Male individuals often belong to Y-hg G2 and mitochondrial lineages are also clearly Near Eastern. Yet a subset appear to be different, under finer scrutiny. For example Early Neolithic males from El Trocs & Cueva de Chaves are characterised by lineages I2a1b and R1b-V88. Moreover, some of these groups had a poorly developed cereal agriculture and their isotopic signature indicates a high meat diet, consistent with a specialised animal husbandry economy. When paleogenomes from Italy are published, we will have full clarity on the Mediterranean Neolithic. Late Mesolithic sites Iberia (Auban & Oliver 2014). In Iberia, the 5000 to 4000 BC period represents less clearly understood ‘post-Cardial’ period. Also at this point, agriculture takes definitive hold in Cantabria, and from the outset appears to be associated with the Megalithic phenomena, which expanded from western France c. 4500 BC. Throughout Iberia, WHG ancestry rises, with up to 30% in the north, and correlates with (? a new) dispersal of Y -hg I2a2 and I2a1a1 lineages. A further set of changes occur from c. 2900 BC (pre-Beaker Copper Age), but they are beyond the current scope. 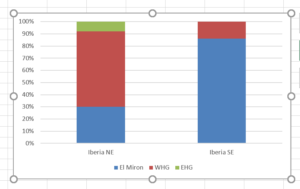 Even with the impressive quality of data, we look forward to exciting papers from Iberia, especially the old stuff ! Population history from the Neolithic to present on the Mediterranean island of Sardinia: An ancient DNA perspective. Marcus et al 2019. Les premiers groupes agropastoraux de la péninsule Ibérique (Auban & Oliver 2014). The Human occupation of southwestern Europe during the Last Glacial Maximum. Lawrence Straus. Lithic technological adaptation within the Gravettian of the Iberian Atlantic region: Results from two case studies. Marcel Bradtmoller et al. 2015. Populations headed south? 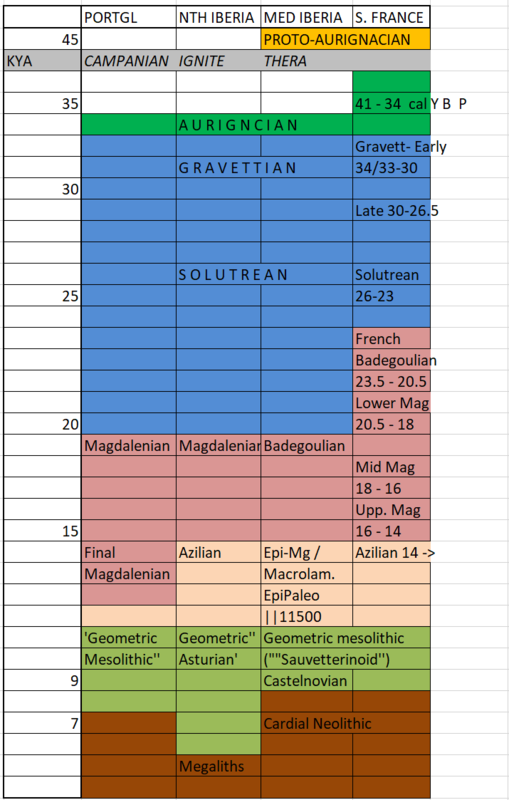 The Gravettian from a palaeodemographic point of view. Andreas Maier & Andreas Zimmermann 2017.